The Battle of the Bar® Created by the World Calisthenics Organization™ is the World’s leading promoter of Professional Calisthenics Competitions. The First of its kind to create Matched 1 on 1 Battles with Weight Classes, Round System, 10-point must, scoring and standardized judging criteria with 3 neutral judges. WCO also hosts a 16 man single elimination tournament which has a goal of finding the top athletes around the world. WCO™ BATTLE OF THE BARS™ at the World Renowned FitExpo! 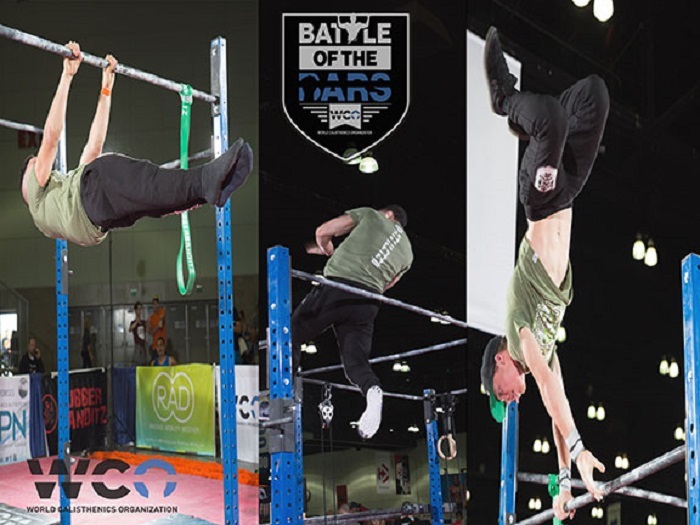 Battle of the Bars® at the TheFitExpo is a can’t miss event, where we match up the Best Calisthenics Athletes from around the world against one another to see who will walk away with the cash Prize, bragging rights and all kinds of SWAG! The stage for TheFitExpo Battle of the Bars US Tour is set to ignite the crowd with some of the most incredibly talented Athletes on the planet, showing the Fitness community this is what our cutting edge sport is all about. The WCO area will also feature Team Demos, Contests, giveaways, workouts with calisthenics specific products and utilities from our Sponsors along with mini clinics on Handstands, Muscle ups and other body weight based movements throughout the 2 day Expo. You will have the chance to meet and greet with all of the Athletes, network and learn from some of the best in the business and overall, what is most important to us is that you walk away from your weekend as one of the best and most memorable experiences you have had in a long time! Battle of the Bars® typically starts at 2:00 pm on the first day of the Expo. Cards to be announced via our Facebook page and Instagram as we complete them. Make sure to follow us for all updated information. The World Calisthenics Organization™ – “Raising the BAR” in Competitive Sports Entertainment.